Truly enjoy the special wedding day while the event staff ensures all details are executed beautifully. From the cocktail hour to the final dance, Plate at Hotel Utica will make the wedding a memorable event for the couple and their guests. 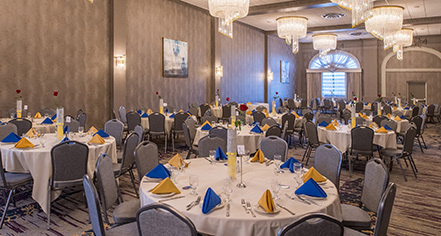 With multiple floor plans available, DoubleTree by Hilton Hotel Utica can cater the wedding as desired, whether an intimate gathering or a grand party. Start the wedding day with a luxurious ceremony in the elegantly decorated lobby with stunning chandeliers and a Titanic-like staircase. Cocktail hour would then begin on the mezzanine with hors d'oeuvres and a bar. 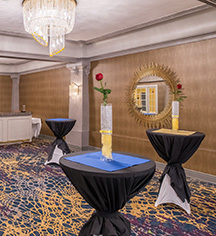 The Crystal Ballroom, adorned with elegant chandeliers, can comfortably seat 220 people with a dance floor, head table, and options to arrange the room in the perfect configuration.